Added a Zodac Review to the MOTU Classics Collector’s Guide. You might take a minute to feel bad for Zodac. He seems to always get the raw deal in MOTU. In the 80s, Mattel conceived his figure as an evil master, DC used him as a neutral character, and in the cartoon, it’s safe to say he tended to favor He-Man in the outcomes. So there’s a little ambiguity there. When the relaunch came in 200x, Zodac again got altered through the production process. The 4H conceived him as an alien, but when Mattel called for the Masters to have racial diversity, Zodac was changed from white to black, given blue tribal markings over his body, and his personality was radically altered. To top it off, they even changed his name to Zodak. For the Classics line, Zodac’s figure has gone back to its roots and is a straight update of the original. Zodac was produced in the same quantity as Mer-Man (who lasted a sum total of 2 hours), Hordak (who lasted an hour), and Man-At-Arms (who lasted 45 minutes), and yet… Zodac was on sale for the better part of 4 days. This is by no means a failure, 4 days is still a success story, but it does look paltry compared to the releases immediately before and after him. So, yeah, it just seems it’s a little difficult for Zodac to get some love. Next time you walk by your toy shelf, you might check on him, dust him off a little, and maybe move him a little further forward in your display. Seems like he could use the ego boost. Zodac, as he was in the old line, is constructed with parts stolen from nearly every other figure early in the line. His arms and legs come from Skeletor, his loincloth is from He-Man, and his chest (for that great hairy look) is from Beast Man. His new pieces are his head, and then his armor and pistol. I’m in between on the head sculpt for Zodac. I enjoy the technical aspects of it, but it’s his expression that throws me. He looks rather complacent, which I guess goes with his neutral stance. There might be a hint of “Yes, Dear” in there as well. It’s hard to tell when you only get the mouth. And there’s the rub. I know the old figure didn’t have it – and maybe no one even knows what is under that hood, but this figure would have skyrocketed in coolness if his helmet was removable. 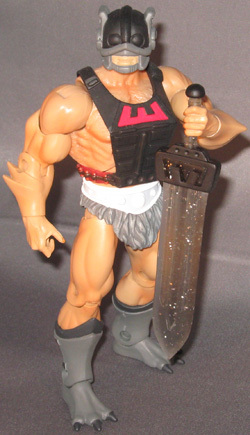 And Mattel could have gotten some serious traction out of it like Wilson from Tool Time or Dr. Claw. His other new pieces, the armor and pistol are mostly straight updates. The gun is like a prop replica of the classic, as is the front of the armor, but the back has some nice detailing added. First, the straps now sport bullets for his pistol, and the back of his armor has been redesigned to give off a jetpack feel. Another nice feature is the near seamless integration of the straps and back of the armor. Great precision work there. For accessories, while everything is neat and classic, I just felt like Zodac needed a little something else. And I wasn’t the only one. First, let me tell you, that the sword below is NOT included with the figure. It is the creation of AFI Blogger Spymagician. He designed, sculpted, and casts the Master Blades himself. I was lucky enough to see his blog post and pick up two swords from him back in early June. The swords are high quality for a custom sculpt, and of course, look great with the figure. Check out his blog for some pictures of other versions he has done of the sword. Spy, if you’re reading, my is hat is off to you! Thank you very much. Paint is the one area where Zodac really diverges. The paint apps to his body, his feet, and his armor are all very sharp. But the paint apps on his belt and helmet seem to be lacking. And not just in mine, but in a lot of pictures I’ve seen across the net. On my Zodac, the white on the belt has bled into the loincloth in more than one area, and the darker greys of the loincloth are also up on the white belt. His helmet also suffers from a lot of inaccurate lines between the grey and the red areas. Now, none of these are horrible. The paint apps are still far better than a lot of toys you’re going to see the next time you’re at Target or Wal-Mart. But at $20 per figure, I want better. It doesn’t help that I was spoiled by great paint apps on the first four figures either. Then, there is the weird matter of his copper nail polish… I’m not sure what that’s about. Overall, Zodac is a middle-shelf figure. He doesn’t deserve to be pushed to the back unless you just don’t like his character. His look is unique enough that he still pops when put in a group shot. I’ve always had a soft spot for Zodac, so I might be enjoying him a little more than the average MOTU Fan, heck I even made an evil version for him to be locked in eternal battle with. Despite my love for Zodac, I still really, really want a Classics Zodak based on his 200x look. I just get excited thinking about the Classics body with the new armor, tribal tattoos, and the staff. The two figures together will make a great pair on the shelf, so c’mon Mattel: Bring on Zodak! I like the way they handled his arms here, but it always cracked me up as a kid that they looked like he had combed his excessive arm hair out to a point. Also, his gun was always one of my favorite of the old accesories, and this repro looks awesome. For the record, I do like his pistol, but that sword just completes the package for me. That’s funny about his arms. If they gave him his white gloves, you could just say they were part of the glove. His head looks too round/soft. It clashes with the rest of the features. He should have been hybridized a little more like Mer-Man and Webstor. It would improve this figure and eliminate the need for a duplicate 200x one. I want a 200x version separate, but I agree that something on the head could be changed and it would make the figure a lot better. I think the gray on his helmet need to have a metallic sheen to it, otherwise it looks to be of the same consistency as the feety boots and the hairy loin cloth. (I also noticed he’s wearing white undies under his man-skirt, which I find amusing). I suppose they needed to put something there. I also find myself liking your custom evil Zodac better than the regular one. Some metallic red overall might help this figure, but it’d need to be darker, less he become Candy Apple Zodac. Thanks for the praise on Zadoc – I think I kinda like him better too. I would pay money for candy apple zodac. she’s right, we have no pictures here of zadoc. i believe we’re owed a pic sir!! has anyone else commented on how crazy cool the bullets are around his belt? cuz they look awesome and i think between those and the jet pack and zip gun, he’s a fun throwback! I totally forgot to mention him. I was going to do it around the part with Spy, but I got caught up getting his links right! And you can find the rest of him here! I really didn’t think about the spaceman/adam strange angle the jetpack illicits. I do like the bullets on his straps, and maybe they’re like energy pellets because I always figured it was a laser gun.